To me, April is the epitome of spring. A time of birth and rebirth, warmth overcoming cold and new life. It's a time for new beginnings and spiritual growth and today's shop fosters this concept on a path that is near and dear to my own heart and life-affirming no matter the season. 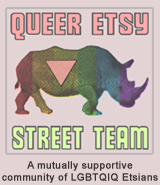 CariocaWitch on Etsy is a shop filled with love and light. Ever since I first discovered this shop, I have returned again and again to pour over the beautiful goods offered there and even today I just purchased from them! In fact, I purchased both of the items pictured here in this post. 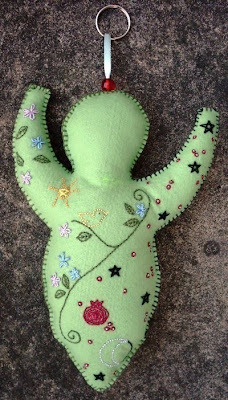 The Goddess poppet to the left is a representation of Persephone, the Queen of Spring growth and of the Underworld. As stated in the item description for the piece as well as taught to me in my youth and that I've taught to others throughout my adult life, Persephone was abducted by Hades and spends half year in the Underworld with her consort. Persephone then spends the other half with her mother in her world. In Greek mythology she, goddess of the soul, is the possessor of its dark and frightening wisdom and she is also the harbinger of spring and a reminder of all the growth and hope that it brings along with it. 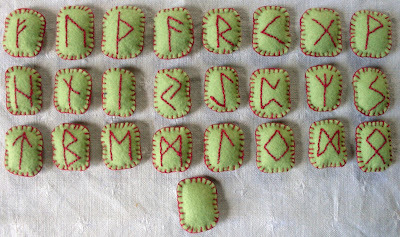 The other item purchased, the felted runes pictured on the right, were picked up for another of my favorite activities. Although runes are usually made of wood or stone, I've picked out these runes, in particular, for the purpose of teaching children about their meaning and uses. I mentor in the pagan community and I can think up lots of fun ways to use these runes in educational games with children seeking pagan parenting advice and activities that adhere to the pagan path. If you are interested in learning more about the pagan path or if you are already on it and looking for a worthy shop filled with love and light to browse through, this is the shop for you! There's lots of information and fun facts throughout CariocaWitch on Etsy and many wonderful items to browse through and enjoy. YOU CAN CLICK ON THE PICTURES ABOVE TO VISIT CARIOCAWITCH ON ETSY AND TAKE A LOOK AROUND OR, IF YOU PREFER, YOU CAN CLICK RIGHT HERE! You can also learn more about the life and times of the artisan behind Carioca Witch, Nydia Macedo, on her Bringing Up Salamanders blog!